Hurst Boiler recently announced the commissioning of its third poultry litter-fueled boiler, the 1600 HP – the first to be installed in the US. We are well aware of the many challenges and problems of litter as a fuel, which is why we spent an inordinate amount of time and resources making sure that we had measures in place to ensure success in the U.S. market. Hurst Boiler, an international manufacturer of a complete line of gas, oil, coal and hybrid biomass fuel fired steam and hot water boilers since 1967, announces the commissioning of its third poultry litter- fueled boiler. “While we have been carefully evaluating the potential to use litter in our boilers in the U.S. market, one of our solid fuel boilers in Guatemala began running almost 3 years ago on 100% litter simply because it was the most cost effective and reliable fuel. Since then, two more systems have been installed and are providing steam to poultry facilities using only chicken litter,” said Tommy Hurst of Hurst Boiler, Inc..
Litter is significantly different from other biomass fuels. In the past, there were problems using poultry litters in boilers designed for biomass. To mitigate the challenges associated with using this type of fuel, Hurst boiler strategically considered each aspect of the process – from the way litter arrives at the facility and the material handling (fuel receiving) equipment, through the way in which emissions are treated. The result is Hurst’s new poultry litter-fueled biomass boiler system that successfully overcomes the challenges to deliver an energy efficient and environmentally sustainable solution. 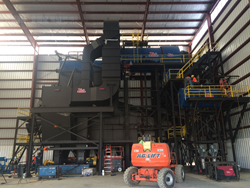 Prestage AgEnergy of Clinton, NC is completing a 1600 HP Hurst boiler installation. From fuel receiving through emissions, the 1600 HP is the first Hurst Boiler system in the U.S. designed and engineered specifically to be fueled by poultry litter. This cogeneration facility is scheduled to be commissioned mid-year and will support Prestage Farm’s turkey operations. Hurst representatives will be available to discuss this new application of proven technology at the upcoming 2016 International Production and Processing Expo at the World Congress Center in Atlanta from January 26 - January 28, 2015, Booth # B7955. To learn more about Hurst Boiler, please visit: http://www.hurstboiler.com. To learn more about the IPPE Event visit http://www.ippexpo.org/. About Hurst Boiler & Welding Co.
Hurst Boiler & Welding Company, Inc. has been manufacturing, designing, engineering and servicing gas, oil, coal, solid waste, wood, biomass and hybrid fuel-fired steam and hot water boilers since 1967. With installations across all industries worldwide, Hurst Boiler is recognized for the highest code standards, innovative engineering and design, Energy Star rating, and renewable, sustainable solutions for green building design and operational efficiency. Also specialized in the manufacturing of modular biomass boiler systems, Hurst’s boiler vessel designs (CRN registered) include firebox, vertical tubeless, hybrid water/ fire-tube, and water-tube. Hurst manufactures seven different types of biomass stoker/gasifiers, which have used 2,000+ different types of biomass fuels. In addition to a complete line of steam and hot water boilers, Hurst Boiler also manufactures a complete line of boiler parts and boiler room peripherals and provides unparalleled turnkey after-market products and services to deliver complete installation and operation to its customers. To learn more about Hurst Boiler, please visit: http://www.hurstboiler.com.